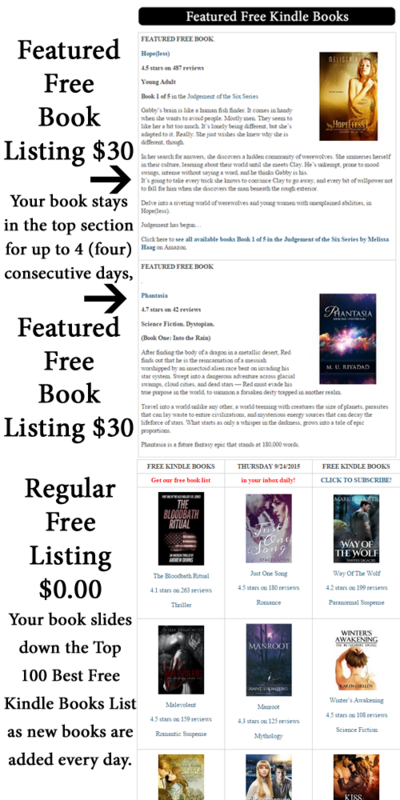 What is the Top 100 Free Kindle Books list? This is a list of books on Amazon that are listed for free ($0.00) for a limited time. This list is updated daily and can be found on Digital Book Today’s website and linked through our daily email. Submitted books that meet our minimum guidelines will be featured on the Top 100 Free Kindle Books list. On the first day, books will appear at the top of the list and will progressively move their way down the list over the course of 4 days. To be featured on the Top 100 list free of cost, your book must meet our minimum guidelines listed below. Want to boost your book’s visibility even more? Get your book promoted to our subscriber list by becoming a Featured Free Book for $30! For further information please contact us by email at AnthonyWessel@DigitalBookToday.com. Fill out the form below to submit your book. Submission must be made 48 hours in advance of your free day. Any other info we need to know? OK to leave blank. Save your time - please do not add a book description. We pull all info from Amazon. Books that do not meet the minimum guidelines stated above will not be accepted. No exceptions. See promotions page to paid options to get books listed that do not meet our minimum guidelines.